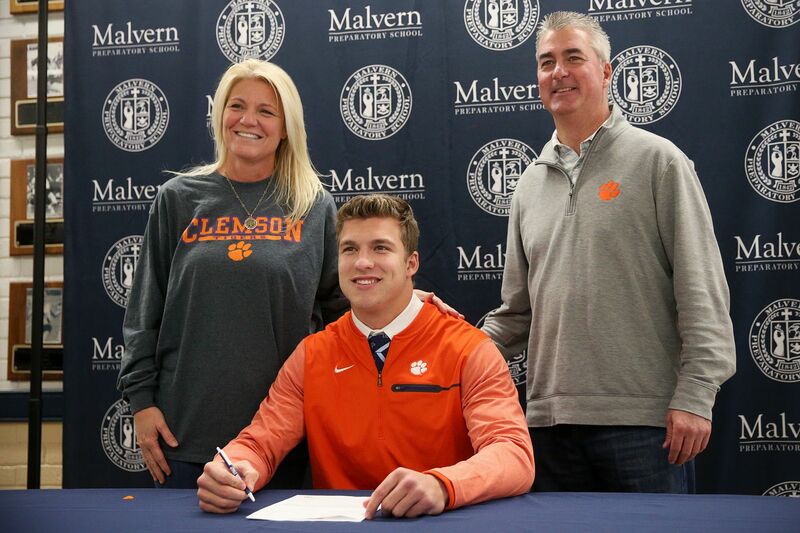 Malvern Prep's Keith Maguire, who will attend Clemson, poses with his parents, Jenine, left, and Keith Sr., right, during the school's signing day ceremony. The national signing period for high school football seniors began Wednesday, and the process took a while at Malvern Prep. That’s because six Friars made their commitments official in a hallway outside the O’Neill Athletic Center’s gymnasium. Malvern Prep offensive lineman Jake Hornibrook, who will attend Stanford, poses with his parents, Dawn, left, and Jeff, right, on Wednesday afternoon. Malvern Prep’s top Division I recruits, linebacker Keith Maguire and offensive lineman Jake Hornibrook, signed with Clemson and Stanford, respectively. Running back and defensive back Quincy Watson (Delaware) and defensive back TyGee Leach (Lehigh) also signed letters of intent. Kicker Sebastian Constantini will be a preferred walk-on at Penn State, and offensive lineman Buck Walsh will play at Bowdoin, a Division III program in Maine. Maguire sparked the Friars to an 11-0 overall record and, with a 5-0 mark, the Inter-Ac League title this season. The 6-foot-2, 220-pounder showed his versatility by playing inside linebacker, receiver, and running back. “It’s a real exciting day, to sign the paper and make it official,” Maguire said. “It makes it a real deal." Malvern Prep's Keith Maguire (4) comes down with an interception on a pass intended for Penn Charter's John Washington (23) in an Inter-Ac League contest. Maguire, who this season notched 108 tackles at inside linebacker, was selected the co-Inter-Ac player of the year with Penn Charter two-way back Edward Saydee. Saydee signed with Temple on Wednesday. “Keith covers so much ground, has great instincts, and is very hard to block,” Gueriera said. Maguire, of Media, was joined Wednesday by his parents, Keith and Jenine, and brother, Ryan. Ryan is a junior wide receiver at Malvern Prep. The 6-5, 285-pound Hornibrook, a fixture at tackle who also saw time on the defensive line, chose Stanford over Clemson and Wisconsin. Hornibrook’s brother, Alex, is a redshirt junior quarterback at Wisconsin. The 6-4, 220-pound southpaw has completed 122 of 205 passes for 13 touchdowns in nine appearances this year. Malvern Prep offensive lineman Jake Hornibrook (75) signed Wednesday to play for Stanford. Hornibrook is scheduled to begin taking classes and working out at Stanford on June 22. Friars quarterback Drew Gunther will be a preferred walk-on at Virginia Tech. He threw for more than 2,100 yards and 24 touchdowns this season.